Tour Confidential: Was Tiger Woods's win the greatest comeback in sports history? Tour Confidential: Was Tiger’s win the greatest comeback in sports history? Check in every Sunday night for the unfiltered opinions of our writers and editors as they discuss the hottest topics in the sport, and join the conversation by tweeting us @golf_com. 1. Tiger Woods has done what many observers once thought was unachievable. He overcame injuries, swing changes, off-course embarrassments, chip yips and even Father Time to win again on the PGA Tour. No one will confuse a 30-player Tour Championship field for the Masters or U.S. Open, but given the circumstances, is this the greatest comeback in sports history? John Wood, caddie for Matt Kuchar (@Johnwould): The win is too fresh to say. There have been some unbelievable comebacks (Hogan almost dying in a car accident comes to mind) and only time will tell where this one ranks. But I’m sure in the end it will be way up there. What this win does do is resurrect golf. Not that it was down, but THIS is why we need Tiger to be like this. The crowds and the reactions were absolutely thrilling and priceless. The other guys are great, but Tiger does something to sports fans no one else is capable of doing. Sean Zak, associate editor (@sean_zak): Someone has to rain on the parade here, but Ben Hogan was hit by a bus and came back to dominate the game. It’s not fair to really compare the two, of course, but let’s wait until Tiger wins a major to deem it the greatest comeback in sports history. Michael Bamberger, senior writer: No. It’s a process. He’s a work in progress. It’s astounding. But Tiger Woods, as a historical figure in the game, is all about the majors. As a human being, where he is from where he was is… immeasurable. Jeff Ritter, digital development editor (@Jeff_Ritter): The majors do mean the most, and I think when Woods gets that done (no reason to think he won’t as we stand here today) it’s indisputable. But here’s the thing: even today, with Woods a now Tour-winner after the depths to which he sank, what other comeback was better than this one? Ben Hogan is on the list. What else? Post-HIV Magic Johnson? Minnesota Vikings Brett Favre? Michael Jordan as No. 45? Kobe as No. 24? You can make a case right now that Woods is already there. A major would just seal it forever. Zak: Jeff, you really didn’t have to mention Favre. Didn’t have to. Joe Passov, courses and travel editor (@JoePassov): Yes — it’s the greatest comeback in sports history, period. Hogan’s was remarkable. He almost died in a car crash and he won the 1950 U.S. Open the next year. But how many times over the past four years did it seem that Tiger was “done?” Multiple times. How many aborted so-called comebacks did we witness, where it was a horrific mess of results? And then a fourth back surgery, where he wasn’t sure he’d ever be pain-free, walking, let alone playing tournament golf? And less than a year later, he’s won a big-time title and has ascended to the top of his sport again? His comeback feat is unequalled in sport. 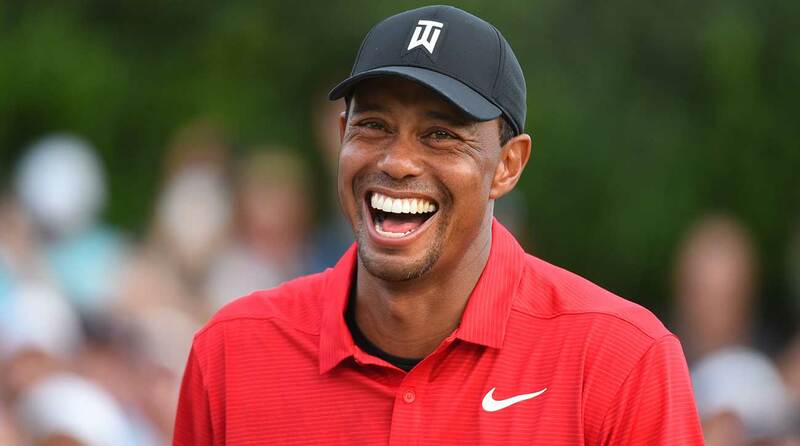 Dylan Dethier, associate editor (@dylan_dethier): You guys seem to have covered the bases here, so I’ll add this: the Tiger Woods we saw in the post-round interview was so giddy he looked like he might be able to float. This may be the happiest moment of his career; that’s enough for me. Josh Sens, contributing writer (@Josh_Sens): What about the Bad News Bears? That team was garbage and then, wham, almost overnight, league title. In golf, at least, I don’t think anything compares. Hogan got badly injured and then recovered to dominate on much, much less competitive terrain. Tiger fell much farther and rose much higher in return. 2. Some of you, in this very forum (! ), have repeatedly said over the last couple of years that Woods would never win again. What say you now? Wood. Na-na-na-na-na-na — thumbs in ears and sticking out my fingers like an 8-year old — I wasn’t one of them. Bamberger: I just repeat what Nicklaus says, and Big Jack always believed he’d win again. Truly, I always felt he would. A major I’m still unsure about. Of course he could. This whole thing is about not putting limits on athletes or people. Until you actually can. Zak: Oh, I was definitely one of them saying he wouldn’t win again. I feel fine about it, too, because he gave us absolutely nothing to believe in. The first sight of anything to believe in was Albany in the Bahamas… the swing speed that followed… the Valspar after that. Now, I say the greatest golfer in the history of the game has somehow become exactly that again, no questions asked. It’s incredible. Ritter: I was slow to write him off (I even stayed with him through the chip-yips! ), but last year, in the aftermath of the DUI and the fusion back surgery, I finally cracked and thought he was done. I’m elated that I was wrong. Are we serving crow to the panelists tonight? Passov: Well, I don’t want to apologize for being the guy here who always defended Tiger, who always said he’d come back. How would I know? I’ve just always sensed that there’s something different about Tiger, toughness, inner drive, supreme confidence — what you will. He was like Ali, like Jordan. He wasn’t done until he said he was done. When I talked with him last December, he wasn’t making any bold predictions, but I could see him oozing confidence and satisfaction when he said that it was just amazing to be pain-free. That re-confirmed for me that he was on his way back. Dethier: I actually thought he’d win earlier, once it was clear he was cooking with gas this season. But I don’t think I deserve much credit for that, either. Now? I say I’m excited to see him try to win again. Sens: I say I was dead wrong, and I’m glad to be proven so. Tiger Woods had plenty to smile about on Sunday night. 3. How does this alter the landscape of the Tour moving forward? Can this version of Tiger have several more years of successful, winning golf, including more major wins? Is 18 back on the table? Bamberger: The whole example, the whole point here, is to say there’s no reason to think 18 should not be back on the table. Although I cannot see it. But it doesn’t matter what I think. Tiger’s the one doing the work. He is the one who understands his favorite word, process. Wood: As always, if his health remains, he looks to have at least five more years of championship-caliber golf. That’s 20 more majors, and given the fact that he had a chance to win two this year, before this win, I’d say everything is back on the table. As far as the landscape of the Tour, WHY are we changing the playoff format? The scenarios that were going on on that back nine were some of the most exciting things I’ve seen in golf in a long time. I kind of like the idea of two different things going on at once. Zak: It sure seems like Tiger has many more years left in the tank. This week doesn’t change that at all. We should have been thinking that after Carnoustie. As many of us have said, he needed to relearn how to win. The Tour Championship is a great step on the spectrum of wins. The next would be a full field. After that would be a major. Ritter: I don’t know about 18, but I feel good about at least one more. It all depends on his health. Also, it seems like every year, in early spring, we ask ourselves, “Is this the most hotly anticipated Masters ever?” We can break that one out early. As in, today. Passov: I’ll agree with John Wood on Tiger’s prospects. He was right there on the back nine of the season’s final two majors, so why shouldn’t he be in the mix for several more? Eighteen is clearly a stretch, but why preclude the possibility? He’s once again one of the best players on Tour, so more wins and at least one more major is a realistic expectation. The Tour has to be LOVING this. Dethier: It changes everything. Y’know the merry-go-round that’s been happening in the world’s top spot (Dustin Johnson just reclaimed his No. 1 rank from Justin Rose)? Well, there’s going to be another player vying for that spot. Before 18 comes 15, and I think come Augusta we’ll be a tad bit intrigued as to his chances. Sens: Beyond the impact on the Tour, there’s the impact on the game. No sooner had he won that an email appeared in my inbox from the operates of Gleneagles, a great scrabbly muni in SF. It was an open letter to Tiger, hailing his comeback, thanking him for his influence, detailing the ways his return has given a boost to their tee times… how his effect on the game, first apparent decades ago, is still as strong as ever. 4. Where does Tiger’s walk up 18, tears in his eyes and huge galleries filling in behind him, rank among your all-time Tiger moments? Wood: Even though it wasn’t a major, the comeback factor and emotion of what was going on ranks it way up there on his list. It’s so fresh and raw right now, but I suspect it will stay way up there for a long time to come. Bamberger: It was scary. (I was in it.) It was thrilling, once I came out of it. It’s top-50, and that’s saying a great deal. Zak: As someone who has worked here only as long as Tiger has struggled (May 2014 onward), it was quite the sight. Rory jumping out of the way, fully aware of the madness. It’s definitely in my top 10, though, as Bamberger has noted, there have been many, many Tiger moments. Ritter: I don’t know where it ranks, but it feels like a nice little bookend to his tearful embrace of Earl behind the green at Augusta in ‘97. This win isn’t that seismic, but it’s big and emotional all the same. Passov: Tiger’s presser didn’t exactly reveal a guy doing cartwheels. He seemed almost relieved. The lack of birdies down the stretch and the paucity of other great players raising their games took away from the performance a bit, but it’s clearly top 10 in terms of impact of him and on the lives of the folks who were watching. Sens: You’re right about that presser, Joe. Dare I say that at seemed almost normal to see him back in that spot, discussing yet another win. Crazy. Dethier: The massive crowd building in behind him was ridiculous. I remember a mass of humanity assembling behind Phil Mickelson as he cruised down 18 at Merion, hoping to tie Justin Rose. But this was a whole other level of frenzied. He looked like a member of the freaking Beatles. Everyone wanted to be a part of it, and it was moving to watch.